Artful History offers an engaging, and unexpectedly frank, look into the business of art restoration, including backroom dealings and restorer shenanigans, such as cutting up paintings and sculptures to make them "better" or removing an element from a painting for one client and then replacing it for another. 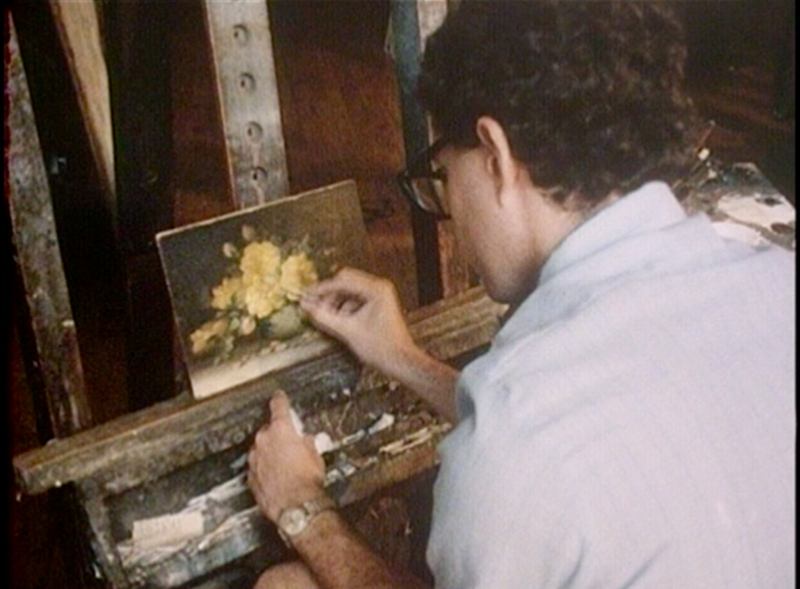 The word artful in the title of this work does double duty: the video illuminates a largely invisible and unregulated aspect of the art world in which the preservation, restoration, and sale of art can involve nefarious doings, and it reveals the cunningly manipulative power of the pairing of image and text in the cinematic context. Dion and Simon, longtime interlocutors who collaboratively produced this work, share in their individual practices the desire to examine regulatory structures that shape culture and normalize tendencies that would otherwise seem bizarre. "Artful History, a Restoration Comedy." Take It or Leave It: Institution, Image, Ideology Digital Archive. Los Angeles: Hammer Museum, 2017. https://​hammer.ucla.edu/​take-it-or-leave-it/​art/​artful-history-a-restoration-comedy/​.